Quo headlined the Norway Rock festival on 7th July. An excellent small set of pro photos of the band in action can be seen here, with Rhino sporting a white England soccer T-shirt on stage! A one-off screening of the "Hello Quo" documentary in its full-length director's cut format took place at the beautiful old Regent Street cinema in London on 12th July. On the evening before the 33rd anniversary of "Live Aid", John Coghlan and Bob Young were in attendance and the film's director, Alan G Parker, gave a Q&A session after the screening (in which he revealed the film cost £1.41million to put together!). Francis's daughter Bernadette got married in Toronto on 14th July and Francis attended and gave her away. The wedding received a lot of UK press attention, the following coverage from the Mirror is an example, titled "Status Quo legend Francis Rossi says walking daughter down the aisle was more 'terrifying' than opening Live Aid" and written by Ruth Hughes. "He has played at sold out gigs around the world and entertained more than a billion viewers in 110 nations when he opened Live Aid. 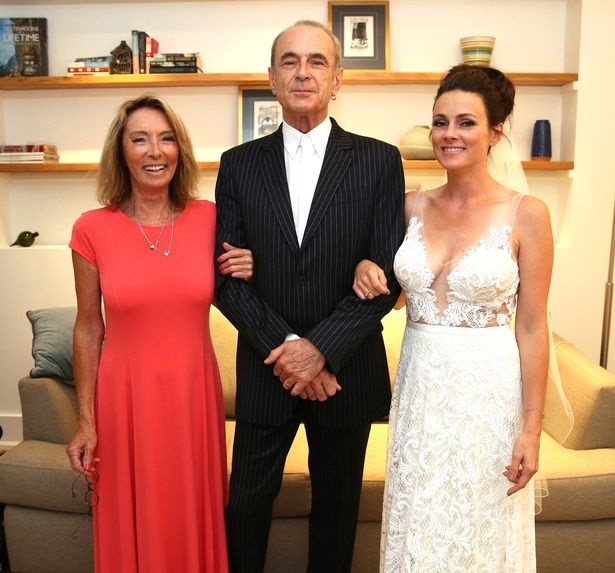 But Status Quo legend Francis Rossi has admitted that walking his daughter down the aisle was "the most terrifying day of my life". The father-of-eight looked on with pride as beautiful bride Bernadette Rossi married her long-term partner, Neal Lyons, in the typically rock 'n' roll setting of a music club in Canada, where even the 'aisle' was lined with vinyl LPs. Bernadette, 33, who lives in Toronto and has her own band, Bernadette and the North, later took to the stage to play alongside her bandmate and new husband, Neal, 36, at the evening wedding ceremony in The Hideout, Toronto’s top music club. Francis, 69, who has had hits with Whatever You Want and Rockin' All Over the World, said: "Honestly, it was the most terrifying day of my life. "When we were getting ready before going over to the club, I turned to Bernadette and said, 'Why did I agree to this?'. It took away the nerves and we both cracked up. Even now I still get apprehensive before a gig, but then I go on and it’s always fine. "Later on, before we started down the aisle, Bernadette turned to me an said the same thing back to me. It was a lovely moment and it made me realise just how alike we are. Then we started walking and it was absolutely fine. "Bernadette looked fabulous. She really did look radiant. The look in her eyes when they were exchanging vows was very moving. I could see her struggling to control her emotions. "I am a very proud father, what more can I say! It was a very happy day." Bernadette’s mother, Elizabeth Gernon, a former music promoter, was also at the unconventional wedding, which took place on July 14. The ceremony was conducted by Bernadette's bass player Tom Hodgins and the bride arrived in a royal blue chevy pickup truck. Bernadette wore a long heavy lace white dress with a low back and plunging neckline. A simple veil and a bouquet of intricate paper flowers set off the look. The groom sported a tuxedo with his late grandfather's pocket square, while the Quo lead singer wore a blue pinstripe suit. Bernadette said: "It was a great day and to have everyone come over and to travel so far for the wedding was fantastic. It was wonderful to have so many family and friends there. "We didn’t want a traditional wedding. We wanted a real party where everyone could enjoy themselves." Bernadette's band has supported Status Quo on their In Search of the Fourth Chord UK tour and her father's solo tour. The couple were cheered by onlookers as they walked around the city after the service. The city's fire service even let the pair borrow a fire truck for photographs. Bernadette added: "We'd waited so long before we got married that we didn't expect it to be anywhere like as much fun as it was. But the day ended up being so much more than we had ever imagined it could be. It was way more special. It was truly wonderful." Francis said: "When I first met Neal it became apparent to me within a couple of hours that Bernadette loved him and that was good enough for me. He also seemed to fit in very well with everyone. There was nothing awkward about it – he became one of the family almost immediately." Speaking about their romance, Bernadette said: "We first met when I went to Neal's birthday party at a club in Toronto in about 2005. He was working with a band who was playing there. I didn't know him but a mutual friend introduced us. "At the time, he was living in a big apartment and they used to have lots of parties over there. A couple of months after we first met, a friend took me to one of them and I got chatting to him again. We discovered we had a mutual love of music and performing so we started to hang out a bit. At the time, though, I was living a little way out of Toronto so we only got together a couple of weekends a month. "The more we saw each other the more we realised how much we liked each other. We also teamed up musically – we'd bounce song ideas off each other and we'd share what we'd written. In fact my first album, Bernadette and The North, has songs written by myself, songs written by Neal and songs written by the both of us on it." "The first time Neal met dad was when he came with me to England for New Year in 2006 and we stayed at my dad's home," added Bernadette, who honeymooned with Neal in Jamaica. Neal revealed: "I didn't actually ask Francis for Bernadette's hand in marriage, not because I don't have the utmost respect for him, I do, but because it just seemed too old school somehow. I think women should make their own minds up. But I did go down on one knee!" Quo played their first and potentially only non-festival gig in the UK during 2018 on 21st July at Middlesbrough Town Hall. A packed house enjoyed the current set and a stunning set of professional photos (from Steve White) can be seen here. Quo headlined the Scottish gig of the 80s-themed Rewind Festival on 22nd July. Some photos from the local Courier newspaper can be found here. Quo played at the Northern version of the massive CarFest festival on 27th July. Great weather ensured big crowds and some photos from the Chester Chronicle newspaper capture the atmosphere (and include a few of Quo on stage) here. Quo were the first rock act to ever perform at the Country Rendez-Vous Festival on 29th July. An excellent set of professional photos of the band in action can be seen here and a short interview with Francis at this festival can be seen here (in which he reveals the band are currently recording a new rock album! ).